Delta employees, retirees and customers donated a record 11,085 pints of blood at Delta-hosted American Red Cross blood drives across the system for the fiscal year ending June 30, 2018 — an 18 percent increase from the previous year. This unprecedented record moves Delta to the No. 1 spot for corporate blood donations in the U.S., marking the most successful year since the airline’s partnership with the humanitarian organization began in 1941. Delta was No. 10 on the corporate sponsor list just five years ago. “The dedication of our Delta blood donors and blood drive coordinators continues to grow stronger year after year, and there is no better indicator than the numbers — 11,085 pints of blood donated and the potential to save more than 33,000 lives,” said Tad Hutcheson, Managing Director — Community Engagement. 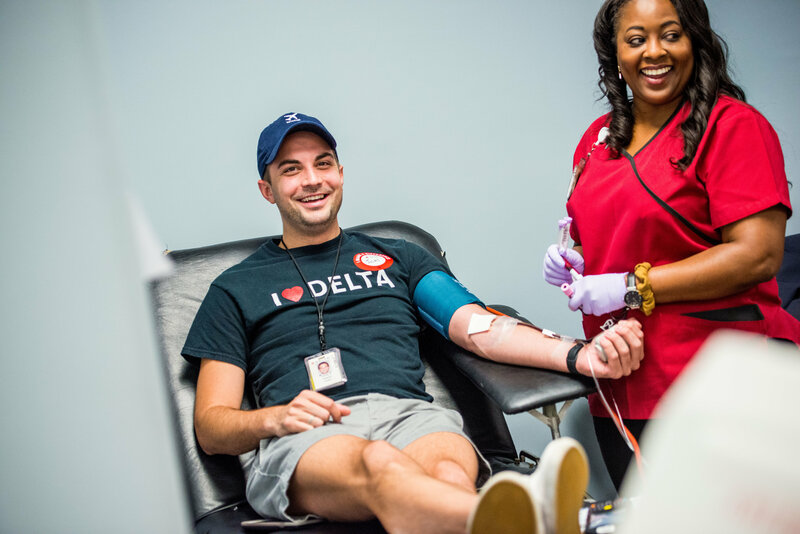 This year the airline hosted 214 blood drives in 36 locations, including the Red Cross’s largest blood drive in the country hosted at Delta’s Technical Operations Center in Atlanta. The airline also added inaugural drives in Augusta, Ga., Charlotte, N.C., Mobile, Ala., Norfolk, Va., San Francisco, Calif., and Washington, D.C., expanding support to more communities where Delta people live, work and serve. Delta is also a donor to the Annual Disaster Giving Program at the $1 million level, which helps to enable the Red Cross to be strategic and proactive in disaster response. The company is also a title sponsor of the Red Cross’s 2018 Sound the Alarm campaign which installed over 100,000 smoke alarms in homes throughout the country last spring. The Red Cross is Delta’s longest standing not-for-profit partnership dating back to WWII.